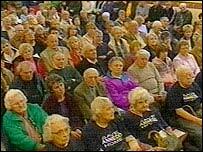 More than 500 people attended a meeting to object to the closure of a residential home in Carmarthenshire. 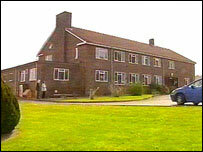 The 31-bed Annedd home faces demolition by Carmarthenshire council because it does not meet care home standards. It will be replaced by £4m flats but the council said the new development would provide the same level of care as in the old building. Care workers said residents and staff had been left "devastated". More than 500 people attended a public meeting in Llanybydder on Thursday. Kathy Daniels, a carer and kitchen assistant at The Annedd, said: "The mood in the care home is horrendous. "The staff are worried sick about the clients, some of whom have been here for 20 years. "It would kill some of them," she claimed. "We have had to watch one male client very carefully because he said he wanted to die after hearing the news." Mrs Daniels said they were told about the demolition of the home two weeks ago. "It feels like we've had no warning whatsoever," she said. "We thought we would be getting a refurbishment because some of the bedrooms were not big enough." There are also fears some of The Annedd's 35 staff could lose their jobs in the closure. Councillor Kevin Madge from Carmarthenshire county council said, where possible, staff would be offered "alternative employment opportunities within the council" and would be considered for posts in the new scheme. The new development will provide 24 assisted extra care flats, 14 for people with dementia, five respite care flats, a specialist day centre, community meals on wheels and office accommodation for domiciliary services. Carmarthenshire council say all existing residents would be offered the chance to live in the new development when it is completed in two years time. Those who are not well enough to live there will be provided with an alternative care home placement, said a spokeswoman. But Mrs Daniels said the nearest care homes may be too far away for some relatives. "Some of the clients' husbands and wives do not drive so it will be difficult for them to travel to homes in Newcastle Emlyn, Carmarthen and Llanelli," she said. "They won't be able to see their relatives and loved ones on a regular basis." During the public meeting, Carmarthenshire county council were accused of a lack of consultation with the general public. Mrs Daniels said £1.460 was raised towards a campaign which would fight the decision. Relatives who attended the meeting also said unfair pressure had been put on them to move their elderly relatives from the home at the earliest opportunity. Mr Madge said Carmarthen county council, along with Gwalia Housing, have organised a formal public meeting about the closure on 26 June where full plans would be made available. "Full and thorough consultation on all care homes in Carmarthenshire has taken place since 2002," he added. "This includes public meetings, discussions with staff and residents, a regular newsletter and the publication of information. A meeting was held at Annedd to inform staff and residents about the plans prior to making them public." Carmarthenshire council's director of social care and housing Bruce McLernon added: "Places at the £4m facility will be offered to residents who wish to return. However, if their circumstances have changed in the interim period and their care needs are greater, they will need to be re-located". He said that they anticipated that staffing levels would be comparable and existing staff would be "very much encouraged and supported to apply for the posts should they wish to." Mr McLernon said that a similar development three years ago at Burry Port had been "an outstanding success" and staff and residents were invited to see for themselves.